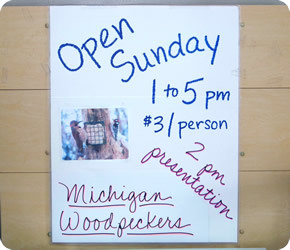 Nature Discovery’s home-based nature center is located on six acres north of Williamston, Michigan. 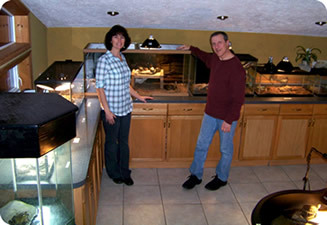 Here, we maintain and display the state’s largest collection of live Michigan reptiles and amphibians. We use the nature center (an addition built on to our home - the front portion of which is a farm house over 120 years old) to host presentations, birthday parties, day camps and special classes. We often tell people that we bought our house, not for the qualities of the house itself, but for the frog pond out back. A highly prolific vernal wetland takes up about a third of the property. 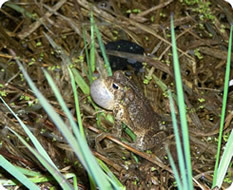 In our first spring here, we were excited to count seven different frog and toad species singing and egg-laying on the pond. A warmish night in April or May can be deafening here. Having the fortune to live adjacent to this powerful force of nature inspired the idea and provided much of the content for our educational and environmental CD, Frogs of the Great Lakes Region. We utilize this wetland and its living resources in many of our programs. For an extra-wild experience, sign-up for one of our after-dark pond wades in the spring. Watch for information in our April and May monthly newsletters. One Sunday each month our “big little” nature center is open to the public from 1 to 5pm. Admission is $5/person. A friendly and knowledgeable staff person is always on hand to make the experience a highly interactive one for all ages. Let us take you on a tank-by-tank, species-by-species tour. Hold a snake or two - or five, if you’d like! We’ll take a picture and email it to you. Feed the turtles, frogs or salamanders. Ask one of our staff to lead you on the trail, or take a walk by yourself. A special presentation is given at 2pm on each open Sunday. The topic is described in the monthly newsletter. Would you like to pay a visit on a day other than our monthly open Sunday? Contact us for a special appointment.